Mr. Guyader has been involved in organizational performance improvement projects and improvement of the flow of information projects both for hospitals here in Canada and in Europe. 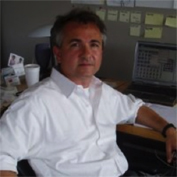 He specializes in the improvement of processes, information flow, planning, forecasting and supply chain in hospital applications on behalf of McKesson Corporation and, in the past, for Awarix Inc., Greycon Inc. and Revere Technologies. He is a graduate of the Institut Supérieur du Commerce de Paris.